Welcome to Bellavista Guest House where we strive to make guests feel they are staying in their own home from home. Bellavista is an Orcadian family run Guest House in a quiet, peaceful area of Kirkwall, Orkney. Bellavista is situated near the shore and is a 5 minute car journey or a 15-20 minute shore hugging walk from Kirkwall harbour. Bellavista is ideally situated for guests wanting to travel around the mainland of Orkney visiting the archaeological attractions, bird watching, admiring the scenery or taking a boat to visit some of the islands. We have lots of leaflets, resource books and local knowledge to help guests plan their time. Throughout the Guest House we have free Wi-Fi and a guest computer with free internet access and a printer. Our Guest Lounge is equipped with a fridge-freezer, microwave, toaster, tea and coffee facilities, dishes, cutlery, etc and guests are able to make light snacks and sit at the table to eat their food. Takeaways can be eaten in the Guest Lounge. The lounge window looks out to Kirkwall Bay where you can watch the ferries and fishing boats sail past and the cruise liners either anchored in Kirkwall Bay or at Hatston Pier. For guests travelling on to Shetland or Aberdeen with 'the late boat' we offer the use of the Lounge at any time that day or to sit in during the evening while waiting. Guests can also have use of our public toilet. Luggage can be left with us on the morning of departure. Over the past few years our breakfasts have evolved to the changing needs of our guests. As well as offering the traditional cooked breakfasts guests enjoy having the choice of a cold breakfast, buffet only or a light breakfast. The main breakfasts, served in the Breakfast Room, is between 7.15 and 8.30 am. The Light Breakfast is a self service breakfast in the guest Lounge and can be taken at any time to suit guests needs, whether you want an early start or have a lie in. Guests let us know each evening which type of breakfast they want for the following morning to fit in with their plans for that day. We also offer Room Only rates. Breakfasts include locally produced food from Williamsons Butchers in Kirkwall (includes gluten free sausages and black pudding), Free Range Orkney Eggs from Nancy Fergus, Orkney Oatcakes from Stockans, Stromness , Orkney Milk and a selection of Orkney Cheddar from Orkney Cheese and The Island Smokery, Stromness. At Bellavista Alan makes Farmhouse Cheese and Patsy makes Jams, Chutneys and Bere Bannocks. Bellavista has its own large private off-street car park where we can have anything from vintage tractors, to buses or vans and lorries staying with us. 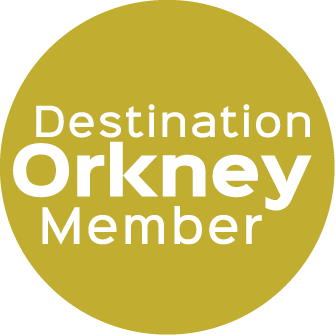 We welcome guests who travel to Orkney on their bicycles or hire ones in Kirkwall. Guests are given a key to our locked shed and are able to access the bikes whenever they want, not depending on us to open it up for them. Bellavista has a Guest Laundry Room where clothes can be washed and tumbled dry for £8.00 per load. Bellavista tries to be environmentally friendly through having solar panels fitted to the roof. They generate electricity which is then used within the house. The Guest House is heated by air source heating with a heater unit in each bedroom. Guests are able to control the level of heating they require. We recycle as much as possible through the local authority recycling services.